It’s “new outfit for Jotaro” day! New Outfit for Jotaro Day is one of the best days of any year. 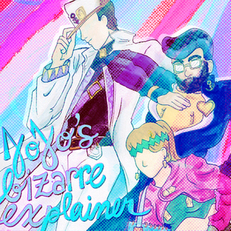 We get to talk about pure heterosexual love, and also how easily Josuke is distracted by balls. Jotaro has very poor phone manners, an extremely high pain threshold, and a heretofore unknown passion for Rat Science. Common vermin: yet another living thing that has more strength of character than Koichi. And it’s possible, nay, *probable* that this entire episode is a convoluted courting ritual for Jotaro and Rohan.